The trend of layering multiple bracelets isn’t going anywhere soon and the best part about it is you don’t have to start from scratch. 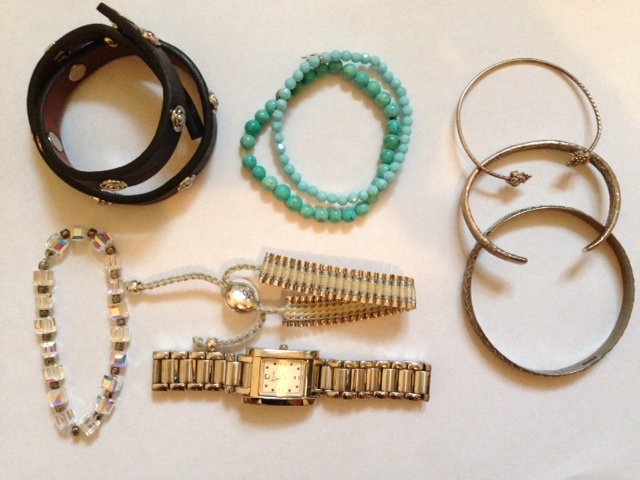 Look through your jewelry box…chances are you’ve already got a lot to work with. Mix it up with different widths, textures, colors and styles. Three to four pieces will give you the look, but feel free to add much, much more! Add a bit of an edge with something spiky or leather. Pile on those delicate, thin bracelets–they’re so much more interesting when they’re layered. Try something sparkly to go the glam route. For a polished look only combine one or two colors. Got a watch? Add it into the mix.